Biscotti, you may know, means twice cooked. And these popular Italian cookies boast historical roots dating to the Roman times. Biscotti were a popular road food among travelers during that period, thanks to their long shelf life. These days you’re more likely to see people dunking biscotti in a cup of espresso or a glass of the Italian dessert wine Vin Santo. We’ve got several excellent biscotti recipes. 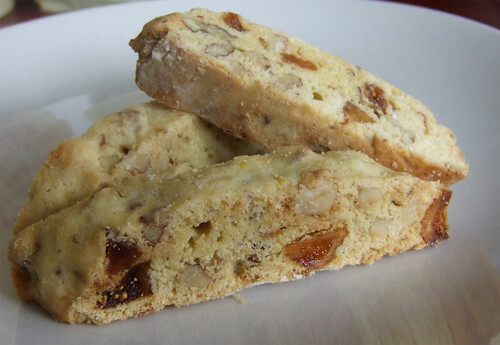 Take your pick from among biscotti made with: almonds; almonds and anise; almonds and figs; or walnuts and pears. All are made using extra virgin olive oil. There’s even a vegan biscotti that doesn’t use eggs. Any of these biscotti would be great dunked in a glass of Vin Santo … or drizzled with our freshly pressed Limited Reserve EVOO. Dessert guru Alice Medrich told us these biscotti, featured in the photo at the top, “have a delicate crumbly cakiness in contrast with the hard dry crunch of more rustic biscotti.” She noted the olive oil flavor “becomes more pronounced over a few days, so do make them ahead.” This recipe was adapted from the one that appears in Alice’s highly acclaimed book, Chewy Gooey Crispy Crunchy Melt-In-Your-Mouth Cookies (Artisan, 2010). (Click here to go to recipe.) We also owe a special thanks to the food blog Bon Eats, which let us use the photo of Alice’s biscotti.